Orchids have edged out poinsettias as the topselling potted flower. That’s allowed Virginia growers to branch out in the $288 million industry. Maple syrup producers in Southwest Virginia are looking for the sweet spot to make commercial sales viable. The RFD-TV series Corn Warriors was incorrectly identified in a fall 2018 Cultivate article. Associate members will receive their next issue of Cultivate in May. The magazine is published quarterly, and back issues can be viewed at issuu.com/virginiafarmbureau. Their origins are tropical, but orchids are successfully cultivated right here in Virginia (Photo by Color Orchids). MEMBERS — Address change? If your address or phone number has changed, or is about to change, contact your county Farm Bureau. They will update your membership and subscription information. This month on Real Virginia: Cheesing it up, and helping families in need Featured this month on Real Virginia, Virginia Farm Bureau’s weekly television program: • Get the facts on cheesemaking and Virginia-made cheeses. • Learn how Virginia’s agricultural community is making sure food banks have a steady supply of fresh milk. • Visit Prince William County, where agriculture is alive and well just outside the nation’s capital. Real Virginia airs nationwide at 3:30 p.m. on the first Saturday of each month on RFD-TV on Dish Network and DirecTV, and on selected cable outlets around the state. It airs weekly on WVPT Harrisonburg, WBRA Roanoke, WCVE Richmond, WHRO Norfolk, WVVA Bluefield and WTKR Norfolk. Watch Real Virginia anytime online at vafb.com. Virginia Horse Festival set for Kentucky Derby weekend The annual Virginia Horse Festival will take place May 3-5 at The Meadow Event Park in Caroline County. Join some of the equine industry’s top experts for three days of clinics, demonstrations and exhibits of interest to horse enthusiasts of all ages. An indoor trade show will offer a wide range of horse-related supplies and services. The Meadow is the birthplace of Secretariat, and the festival will honor the Triple Crown winner with a special Kentucky Derby party. For festival details and ticket information visit VirginiaHorseFestival.com. Farm Bureau warehouse open house offers members big savings Farm Bureau members can save 10 percent on purchases from the Virginia Farm Bureau Service Corp. Products Division at its Feb. 22 open house in Henrico County. The open house will run from 9 a.m. to 3 p.m. at the Farm Bureau warehouse at 1541 Mary St. in Sandston. Refreshments will be available. Savings apply to tires, tubes, batteries, lubricants and a variety of farm equipment parts. For information on specific products, call the warehouse at 800-476-8473. As of Feb. 1, there are exactly 239 days until the 2019 State Fair of Virginia opening on Sept. 27. Approximate amount of sap from maple trees needed to produce a gallon of maple syrup. To learn more about maple syrup production in Virginia, see Page 12. The 2018 State Fair drew more than 3,500 entries in competitions for visual and culinary arts, horticulture and more. If you’d like to participate in fair competitions this fall, you’ve got all winter and spring to perfect that special recipe or move your handcrafted project toward completion. You’ll find the fair’s 2019 competition guidelines at StateFairVa.org this summer. Your membership can help protect your property You can’t always watch every part of your property—and would-be thieves and vandals know it. But your Farm Bureau membership can help deter them. Members have access to free signs indicating participation in Farm Bureau’s Reward Protection Service. Once a sign is posted in public view, the service offers a $2,500 reward for information resulting in a conviction of persons responsible for theft, arson or vandalism on a member’s property. Participation is subject to all terms and conditions of the Farm Bureau Reward Protection Service. Ask for your sign and all the details at your county Farm Bureau office. It’s It’s as easyas 1-2-3. It’sas aseasy as1-2-3. 1-2-3. Call Grainger customer service at 800-472-4643 to update your existing Grainger account with the Farm Bureau organization account number. To be sure you get your Farm Bureau member prices, always reference Virginia Farm Bureau’s organization account number when visiting your local branch, making a telephone order, or setting up your personal account online. If you have questions or need assistance, contact your county Farm Bureau. *FREE standard shipping on all orders shipped ground transportation. Other freight charges will be incurred for services such as expedited delivery, special handling by the carrier, sourcing orders and shipments outside the continental United States. Members eligible for health screening package Farm Bureau members can save on four non-invasive vascular health screenings— carotid artery, abdominal aneurysm, atrial fibrillation and peripheral arterial disease—and have a free osteoporosis screening to assess risk for stroke, heart attack and bone fractures. Life Line Screenings, the national leading provider of preventive screenings, offers these procedures to members at the discounted rate of $145. Watch for mailings about Life Line screenings in your area, or contact your county Farm Bureau for details. Program offers members prescription drug discounts Virginia Farm Bureau’s free Prescription Drug Discount and Savings Program affords members an average savings of 25 percent on all FDAapproved name-brand and generic prescription drugs at more than 63,000 pharmacies nationwide. Members pay no fee to use the program, which is designed for individuals with no insurance coverage for prescription drugs. The Prescription Drug Discount and Savings Program works via what’s known as a “consumer care” or “point of sale card” that can be used by your entire household. There are no medical exams, no waiting periods, no claim forms to file and no exclusions for preexisting conditions. Your county Farm Bureau can provide starter card information and information on how to locate participating pharmacies near you and compare potential savings on generic and name-brand drugs. Virginia dairy farming Virginia is home to about 87,000 milk cows, on 586 dairy farms, according to the U.S. Department of Agriculture and Virginia Department of Agriculture and Consumer Services. • Each dairy cow produces an average of 2,320 gallons of milk per year— an average of 7.6 gallons per day— which is enough to make 6.5 pounds of cheese or 3.1 pounds of butter per day. • In 2017, a dairy cow in Virginia cost about $1,615. The average value of a day’s milk per cow was about $11.84. • Eighty-six percent of all milk produced in 2017 was used and consumed in the form of fluid milk. • Virginia has six commercial milk processing plants, in Augusta, Rockingham and Franklin counties and the cities of Lynchburg, Newport News and Winchester. • The state’s top three milk-producing counties are Rockingham, Pittsylvania and Franklin. was processed. “If it starts with a 51, it’s processed in Virginia. If the milk is processed in Virginia, there’s a really good chance it came from Virginia,” explained Virginia Cooperative Extension agent Sarah Weaver Sharpe. Am I drinking local milk? Real Virginia, Virginia Farm Bureau’s weekly television program, shares one dairy farmer’s thoughts on real milk vs. plant-based “milk” at bit.ly/rv18milk. was vending at the St. Paul’s farmers’ market. He now purchases 100 pounds of beef a week to make between 200 and 250 burgers for his customers. The Lawson family began making and selling homemade maple syrup at Mountainrose Vineyards last winter. and sap was just running out. That’s when I got the idea to tap it ourselves. I wanted my kids to see the process of how maple syrup is made,” he explained. Kitchen disaster, business epiphany The next year he tapped all five maple trees in the yard, and eventually he bought 100 taps and started looking for more maples on his property. That third January he tapped about 30 trees and boiled the sap in his parents’ kitchen while they were on vacation. “I cooked so much that the condensation peeled the wallpaper off the wall,” Lawson recalled with a laugh. “That was when I got banned from cooking syrup inside.” The family decided to increase the amount of maple syrup they were making, bottle it and sell it commercially at the winery. That was in the winter of 2018, and they sold all 18 gallons that had been made from the sap of about 150 trees. Lawson said he would like to increase the amount of maple syrup he’s producing, but he is limited by the number of trees on his family’s land. Michael and Lisa Martucci are another Wise County couple who want to increase maple syrup production on their Doghouse Farm. They previously lived in Alaska, where they operated a small farm and made birch syrup. On Real Virginia Real Virginia, Virginia Farm Bureau’s weekly television program, shares a look at maple syrup production in Highland County at bit.ly/rv17maple. Got a taste for maple? f all this maple syrup talk has your mouth watering, here’s a toasty winter entrée, courtesy of the Vermont Maple Sugar Makers’ Association. It should work just fine with Virginia-made syrup too. You’ll find lots of other maple recipes on the VMSMA website at vermontmaple.org. Preheat oven to 375°. Peel one of the lemons, removing long, thick strips of zest. Reserve the zest, and juice the lemon into a bowl. Add the maple syrup and olive oil to the lemon juice, and whisk to combine. Rub the chicken all over with the lemon zest and garlic. Place the quartered lemon, onion, garlic and lemon zest in the cavity of the chicken. Brush with the lemon juice-maple mixture, and sprinkle with salt and pepper. Put chicken in a roasting pan, and place in the oven. After 30 minutes, brush more of the lemon-maple mixture over the chicken; repeat after another 30 minutes. Continue roasting for an additional 20 minutes or until the juices run clear when cut between the thigh and the body. After removing the chicken from the oven, let it rest for 10 minutes. ove over poinsettias, because orchids are now the topselling potted flower in the U.S. That shift opens the door for Virginia nurseries and greenhouses to branch out in the $288 million orchid industry. In Virginia, the greenhouse/ nursery industry is ranked fifth among the state’s agricultural commodities, with nearly $300 million in cash receipts annually. The orchid family has more species than any other plant family in the world. Once rare and costly, orchids have become a mass-market commodity sold in garden centers and big-box and grocery stores. Phalaenopsis, with its elegant, arching sprays of blooms, is the most common potted orchid. Ben Van Wingerden, owner of Color Orchids in Culpeper County, sees a lot of potential in cultivating different varieties of phalaenopsis and has been building a brand around that focus since 2011. “Orchids are a pretty dynamic Phalaenopsis is the most common commercially produced orchid variety and a focus of Color Orchids. Owner Ben Van Wingerden is shown with his wife, Catherine, and their daughter, Elliot. product,” remarked Van Wingerden. “There is a good marketing opportunity because of their appeal and different types of products you can create. The grower is able to control the blooming time. If you want to sell them during the holidays, you can actually know when they will be blooming.” Van Wingerden sells to high-end grocery retailers such as Whole Foods Market, Trader Joe’s and Wegmans and finds his location to be an asset. “Overall, demand in orchids has grown, and the quality we produce is superior. That has driven us as a company,” he said. “We are in a good spot in the middle of the East Coast, so that has given us advantages. We’ve been able to be a local producer to quite a few markets.” The majority of Color Orchids’ business is in the first six months of the year and represents 60 percent to 70 percent of the company’s revenue. Van Wingerden said Mother’s Day brings the most demand for orchids, followed by Valentine’s Day and Easter. The young entrepreneur, who has seen revenue increase about 25 percent each year, has an ambitious goal for continued business growth. By the end of 2019, he expects Color Orchids to reach annual sales of 2 million orchids out of 35 million nationwide. While Van Wingerden is driving a high-volume orchid business, Floradise Orchids in neighboring Orange County has built a following around personalized service to loyal customers and expert advice on its broad range of orchids produced in limited quantities. Husband and wife duo Janet Cherchuck and Stephen Shifflett grow hundreds of specimen and heirloom orchids in the farm’s 3,000-square-foot greenhouse. Their passion for the flowering gems has fueled nearly 40 years in the orchid business. “We were lucky to inherit a very prominent collection from a big orchid collector that formed the basis of our stock,” Cherchuck said. “We’ve had some plants in our collection for 35 to 40 years and sell divisions of that private stock.” One plant in Floradise’s collection, a lovely lady slipper, dates to 1869. Offshoots of that beauty have been blooming for more than 150 years. Today, Floradise trades mostly in direct sales from its greenhouse or markets in the Washington metropolitan area. The service of creating custom arrangements in unique containers is also flourishing. “More and more of our business is contract delivery. We provide orchid arrangements to restaurants, businesses and private homes,” Cherchuck said. Her customers seem to appreciate the advantage of orchids, some of which can bloom for up to three months. “One of the big selling points of orchids is how long they stay in bloom,” she explained. “Even the ones that bloom two or three weeks are still a better value than cut flowers anybody could buy.” claire.mills@vafb.com Floradise Orchids owners Janet Cherchuck and Stephen Shifflett have grown a variety of orchids over the past four decades. The orchid family has more species than any other plant family in the world. On Real Virginia Chadwick & Son Orchids in Powhatan County offers a unique service for orchid owners. For a monthly fee, the greenhouse will board and care for out-of-bloom orchids until they re-bloom. Learn more from Virginia Farm Bureauâ&#x20AC;&#x2122;s weekly television program, Real Virginia, at bit.ly/rv18orchids. awareness among all road users to save lives and reduce injuries. Areas of particular interest have included speed, pedestrian fatalities and drinking and driving. Virginia Farm Bureau employees (below) like health care account manager Jan Holder (above right) tested their road skills with a mobile impaired driving simulator last fall. Summit got its start. Now in its seventh year, it is a highly-recognized event that is one of a kind nationwide. It brings together insurance professionals, law enforcement, automotive groups, safety professionals and others to share news and research findings. “We try hard to bring in a variety of top-notch speakers and provide many productive learning opportunities,” Brooking added. The 2019 summit will take place in Roanoke in late September. Using a handheld device while driving is a leading cause of distraction-related crashes. Northam established an Executive Leadership Team on Highway Safety that is charged with reducing the rising number of fatalities on Virginia’s roadways. The commonwealth has established a highway safety portal at TZDVA.org, where Virginians are invited to participate in the YourSayVA Digital Town Hall on Distracted Driving by taking an anonymous survey. “The more our state leadership hears from the citizens of Virginia that we are concerned, the more likely changes will happen,” Wells said. Want more information? Visit DriveSmartVa.org or TZDVA.org. Your Farm Bureau insurance agent can provide details about new endorsements for specific equine services. associated with these coverages, so anyone interested in them should contact their Farm Bureau agent for additional information,” DeNoon added. 2019 Medicare seminars being planned With approximately 92,000 Virginians turning 65 in 2019, in addition to people enrolling in Medicare due to a disability, chances are you or someone you know may have questions about Medicare. County Farm Bureaus will again host Medicare Educational Seminars in 2019. The seminars are set to begin across the state in April and will run through September. Dates and locations will be published in upcoming issues of Cultivate. Call or visit your county Farm Bureau office to see if they will be hosting a seminar in 2019. Additional information also is available from Tracy Cornatzer, sales manager of Farm Bureauâ&#x20AC;&#x2122;s health insurance division, at tcorn@vafb.com or 804290-1115. Have questions about Medicare Supplements? Call today! start the next day; however, you will be required to answer a few medical questions to qualify for the plan.” For more information about shortterm health insurance plans, call 800229-7779, or visit vafb.com/quote. Qualifying life events trigger special enrollment period If you experience a qualifying life event during the year, you may be able to enroll in a marketplace plan outside of open enrollment. According to healthcare.gov, examples of qualifying events that trigger a special enrollment period include, but are not limited to: • losing existing health coverage, including job-based, individual and student plans; • losing eligibility for Medicare, Medicaid or CHIP; • turning 26 and losing coverage through a parent’s plan; • getting married or divorced; • having a baby or adopting a child; • experiencing a death in the family; • moving to a different ZIP code or county; • moving as a student to or from the place you attend school; and • becoming a U.S. citizen. If you experience a qualifying life event, there are strict timeframes regarding when you can purchase a marketplace plan, so don’t delay. Call 800-229-7779, or visit vafb.com/ quote for details. If you need a supplemental insurance plan to Medicare, Farm Bureau can assist with that 12 months out of the year. Call your county Farm Bureau office today for assistance, or call 800-229-7779 or visit vafb.com/ quote. A birth or adoption is one of the events that triggers a special enrollment period. Mark Viette of Viette Nurseries in Augusta County said propane fire pits are also an option. “Fire pits are wonderful, because they can be a focal point of the backyard and are great for entertaining,” Viette said. “You can make your own simple fire pit using a guide online, buy a small one that you can move around, or build a complex stationary fire pit to complement your landscape.” Viette noted that permanent fire pits require room, and he recommends a minimum of 36 square feet. The portable pits, he noted, afford some flexibility. “You can incorporate them into your landscape and move them throughout your garden as needed, depending on the season,” he said. Fire pits should be kept 10 feet away from the house and should not be put on a wood surface. “Any foliage or plants you want to place around the fire pit should be kept at a safe distance,” Viette said. He recommended placing shrubs or container plants closer to seating areas than to the actual burn area. Make sure seating is a safe distance from the fire and made with safe materials for use around an open fire. You can use patio chairs or build a seat or bench wall that surrounds the fire pit, McAuliffe noted. Homeowners have found that fire pits add interest, value and more space to entertain to a home landscape. DIRECTIONS Remove and discard skin and outer fat from cooked pork roast. Cut the meat into ¾”cubes (You should have about 4 cups cubed pork). This chile-kissed stew delivers a double dose of warmth. tews can be simmered on the stove, heated all day in a slow cooker, or even made quickly in a pressure cooker-slow cooker hybrid such as Instant Pot. The following three stew recipes—from the National Beef Checkoff, the American Lamb Board and the National Pork Board—will provide bowlfuls of nourishing goodness. In a glass baking dish, arrange the pork in a single layer. Sprinkle with chili powder, garlic, cumin, salt and black pepper. Toss pork until evenly coated with seasonings. Drizzle with lime juice and 1 tablespoon oil; toss until evenly coated. Cover baking dish with plastic wrap, and marinate pork in the refrigerator for 30 minutes. Meanwhile, in a 6-quart soup pot or Dutch oven over medium heat, warm the remaining 2 tablespoons of oil. Add celery, onion, carrot and poblano and jalapeño chiles. * Cook about 5 minutes or until onion is translucent and vegetables are crisp-tender, stirring occasionally. Add marinated pork mixture to vegetables in soup pot. Cook for 2 minutes over medium heat, stirring occasionally. Stir in chicken stock, beer, oregano and bay leaves. Bring mixture to a boil, then reduce heat to medium-low. Gently simmer, covered, for 30 minutes. Stir together flour and ⅓ cup cold water in a small bowl until smooth. Slowly stir flour mixture into stew mixture. Increase heat to medium; cook and stir for 1 minute. Remove from heat. Serve stew in bowls or, if desired, over rice. * Because the oils from hot chile peppers can burn your skin and eyes, wear gloves so your skin doesn’t come in contact with the oils. Also be sure to wash your hands and nails thoroughly in hot, soapy water after handling chile peppers. The American Lamb Board shares the following for a savory stew, noting that it can be prepared in an Instant Pot or on the stove in a Dutch oven. Italian parsley or cilantro for garnish DIRECTIONS Turn the Instant Pot on, and set it to the sauté function. Heat the butter or oil, and sauté the onion for 3-4 minutes, until fragrant. Add the lamb, garlic, salt and all the spices, and sauté an additional 5 minutes until fragrant. Add the vinegar, tomato paste, honey, stock, chickpeas and raisins or apricots, and stir until combined. You have options when preparing this lamb stew. French Country Beef Stew serves up everything that’s wonderful about meat-and-potato meals. Cover, and set the Instant Pot to the “meat stew” setting, or pressure cook for 1 hour on normal/high. Let the pressure release, and give stew a stir. The lamb should be tender and break apart easily. Serve with cooked quinoa, couscous or basmati rice, and garnish with fresh Italian parsley or cilantro and extra chili flakes. If using a Dutch oven, preheat the oven to 325°. Brown the onions in butter, and then add the garlic, lamb, salt and spices, cooking for 5-6 minutes. Add the remaining ingredients, except the raisins or apricots, and bring to a simmer. Cover, place in the oven and bake for 2 hours, adding the raisins or apricots about an hour into the baking time. In a stockpot, combine beef, water and soup mix; bring to a boil. Reduce heat, cover tightly and simmer 1¾-2¼ hours or until beef is fork-tender. Add potatoes and mushrooms to stockpot; bring to a boil. Reduce heat; cover and simmer for 10 minutes. Stir in asparagus; continue cooking, covered, 8-10 minutes or until vegetables are tender, stirring occasionally. Stir in cornstarch mixture; bring to a boil. Cook 1 minute, stirring occasionally. Season with salt and pepper as desired. • Crops; • Farm equipment; • Hay/Straw; • Livestock; and • Livestock equipment. Classified ads will be published in the following issues: • April Virginia Farm Bureau News (mailed to producer members only); • May Cultivate (mailed to associate members only); • August Cultivate (mailed to associate members only); and • September Virginia Farm Bureau News (mailed to producer members only). Finding your member number When placing your ad, be sure to include your Farm Bureau member number, which can be found on your membership card and above your name on the mailing label of your copy of Cultivate. All member numbers will be verified. Motor Company and Lincoln Motor Company private incentives or AXZD-Plans. Some customer and purchase eligibility restrictions apply. Must be a Farm Bureau member for 30 consecutive days prior to purchase. Visit FordFarmBureauAdvantage.com or LincolnFarmBureauAdvantage.com or see your authorized Ford or Lincoln Dealer for qualifications and complete details. Use the form below to provide contact information and the text for your ad. • Ads will be accepted from Farm Bureau members only. • Classified ads are not transferable. • Please type or print. • Classified ads will not be accepted or cancelled over the phone. Indicate the issues in which you want your ad to run. Select the category in which you want your ad to run (Pick one only). Your first ad of 15 words or less is free with your membership. Pricing for additional ads: 1–15 words	$10/ad 16–30 words	$20/ad Additional ads must be accompanied by a check (no cash) for each issue in which the ad is to appear. • Make check payable to: Virginia Farm Bureau. • Ads longer than 30 words will not be accepted. • We do not invoice for classified ads or provide proofs or tearsheets. • Ads submitted without payment will be returned. for typographical errors or errors due to illegible handwriting (No refunds available). Classified ads carried in Cultivate and Virginia Farm Bureau News do not constitute an endorsement by Virginia Farm Bureau Federation and its affiliated companies and organizations. We reserve the right to edit or reject ads, including ads that represent a business in competition with the Virginia Farm Bureau Federation, Virginia Farm Bureau Mutual Insurance Company or any of our affiliated or affinity partners. We reserve the right to edit or reject any advertisement that makes reference to any particular political party or group, religious belief or denomination, race, creed, color or national origin. Mail your ad (and payment) to: Virginia Farm Bureau News/Cultivate Classifieds P.O. Box 27552 Richmond, VA 23261-7552 Or place it via the Virginia Farm Bureau website at vafb.com. number has changed—or is about to—don’t forget to contact your county Farm Bureau office to ensure that your membership and subscription information stays current! One free 15-word ad per membership per year; dues must be paid before placing ad. 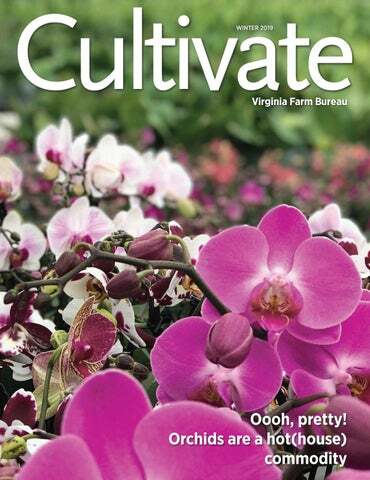 Cultivate is published quarterly with a focus on safe, fresh and locally grown foods and the Virginia farms that produce them.